It’s been a big year for the Specialized road product development team. 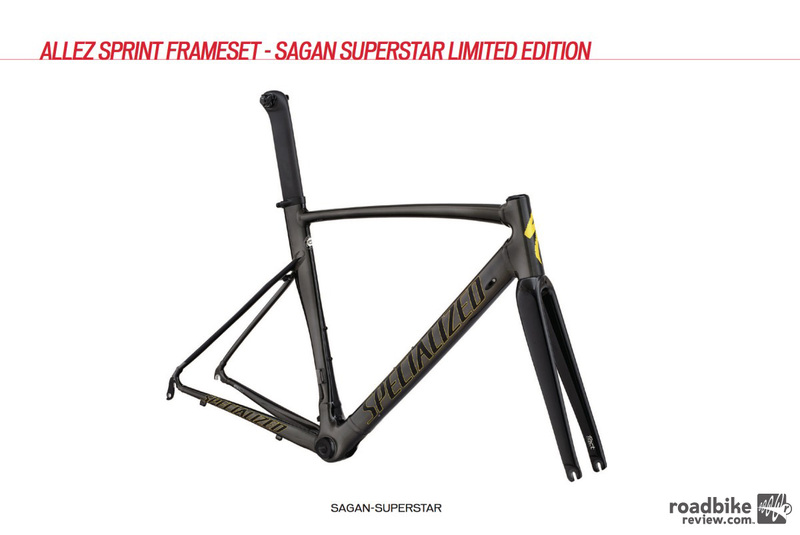 Bigger than ever before, they say. 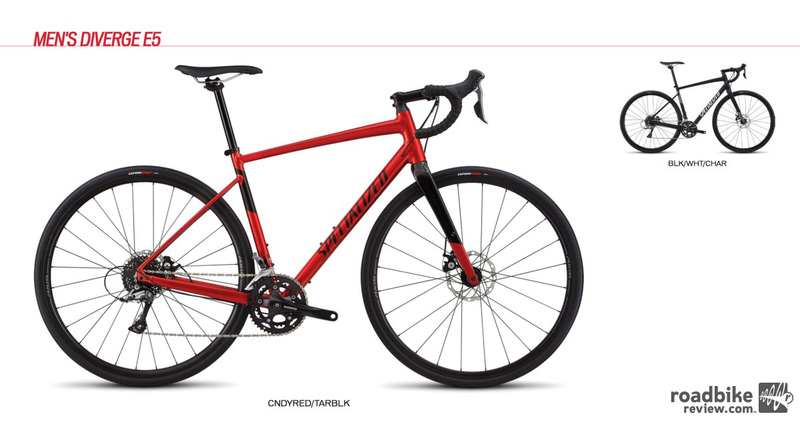 Starting today, the Big Red S is launching three new drop bar bikes (Diverge, Crux, Allez). 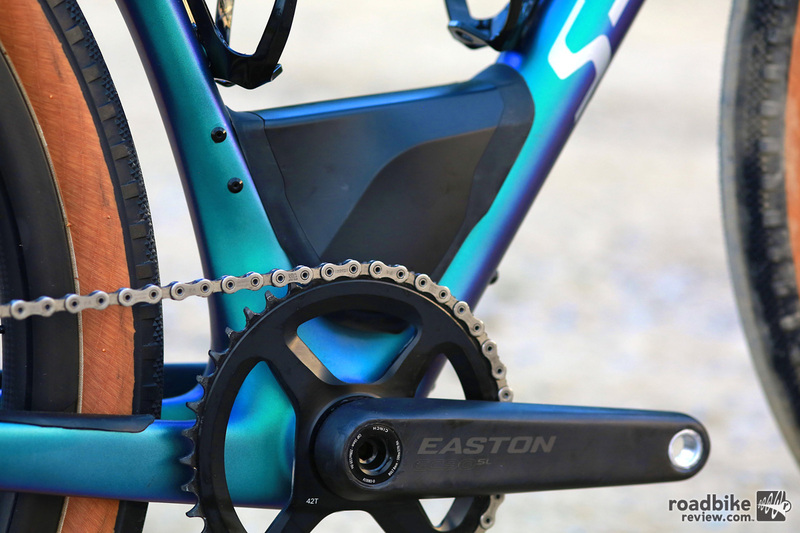 One more will debut June 30 on the eve of the Tour de France (you’ll have to guess on that one for now). 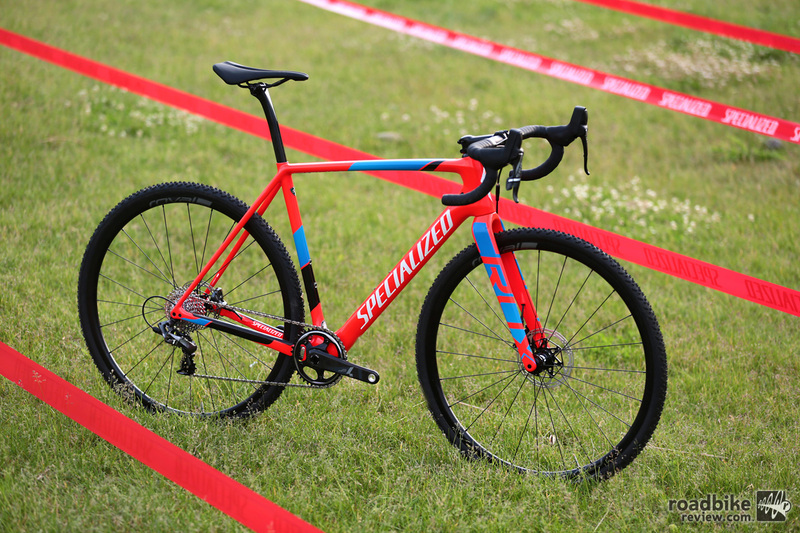 RoadBikeReview and the rest of the world cycling media has been holed up at Mountain Creek Resort in New Jersey for the last several days getting the full download from the Specialized PR team, and putting the new bikes through their paces. Here’s a top line rundown of each. 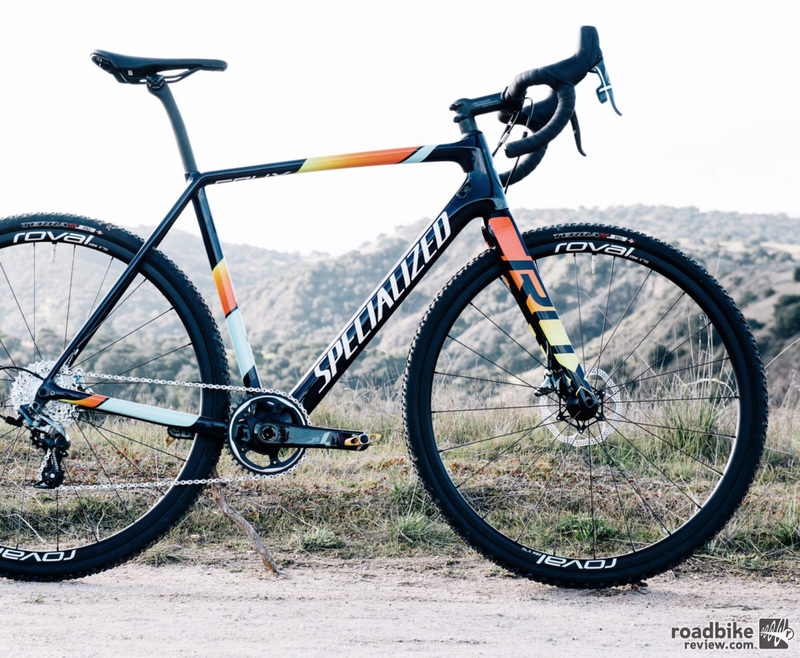 After launching the Diverge a few years back, Specialized’s take on the gravel grinding segment has gotten a significant makeover for model year 2018. 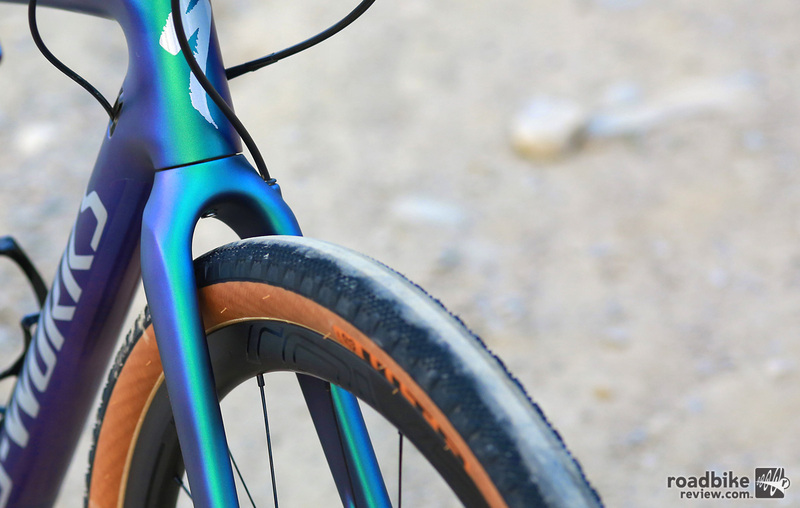 The biggest change is the addition of the Future Shock technology that debuted on its Roubaix endurance platform earlier this year. 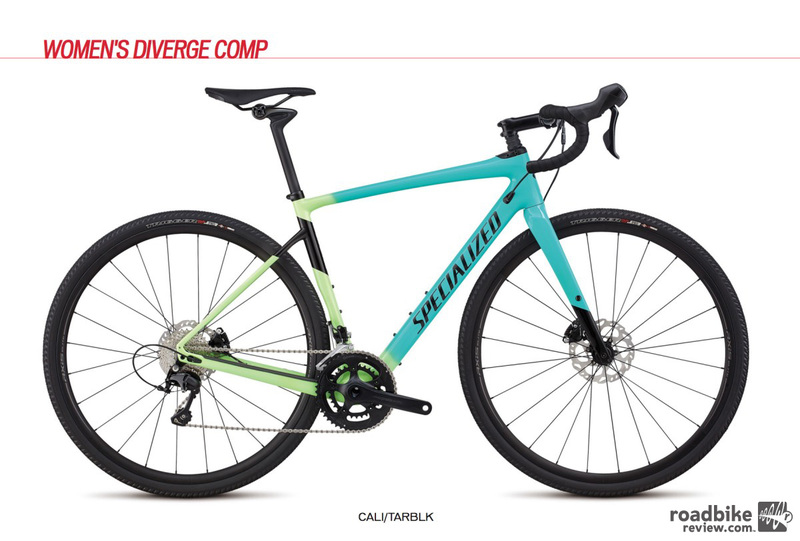 The Diverge’s front end gets the same 20mm of bump taming suspension Roubaix and its sister Ruby have. 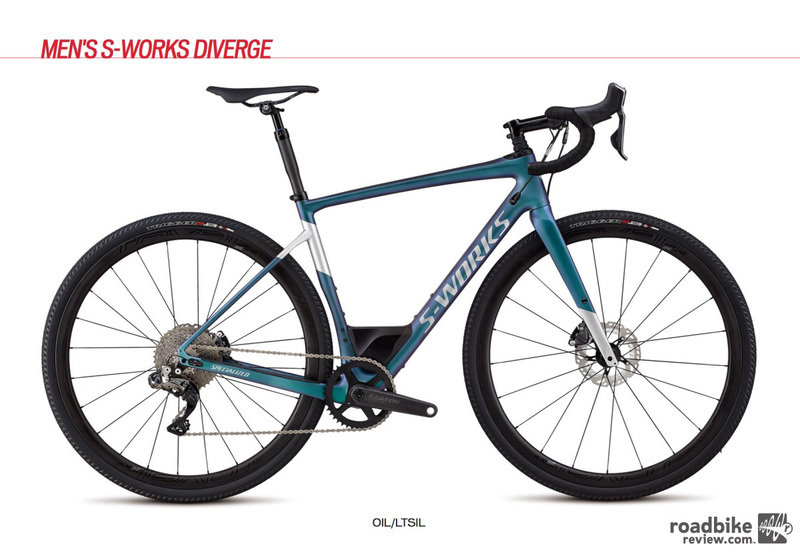 But unlike the road-specific Future Shock, the Diverge’s travel utilizes a more progressive spring, meaning it ramps up near the end of the stroke to resist harsh bottom outs. 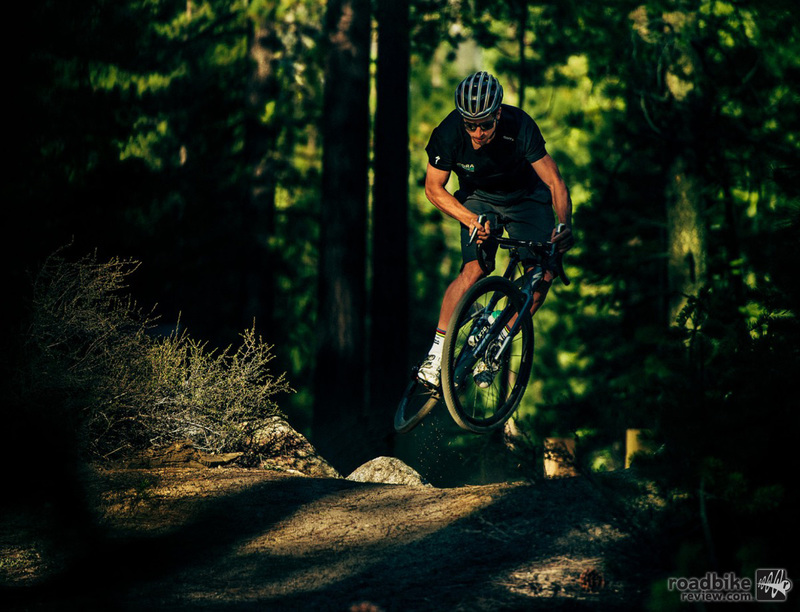 That, the theory goes, helps maintain control and makes the bike more capable in truly mixed-terrain applications, say for instance the rock-strewn double track trails we’ve been testing the bike on the last few days. The reason that’s important is that when spec’d with 700c wheels (as will be the norm), the revamped Diverge already has a stability enhancing low bottom bracket drop of 85mm (compared to 75mm on the old Diverge and 67mm-71mm for the new Crux). 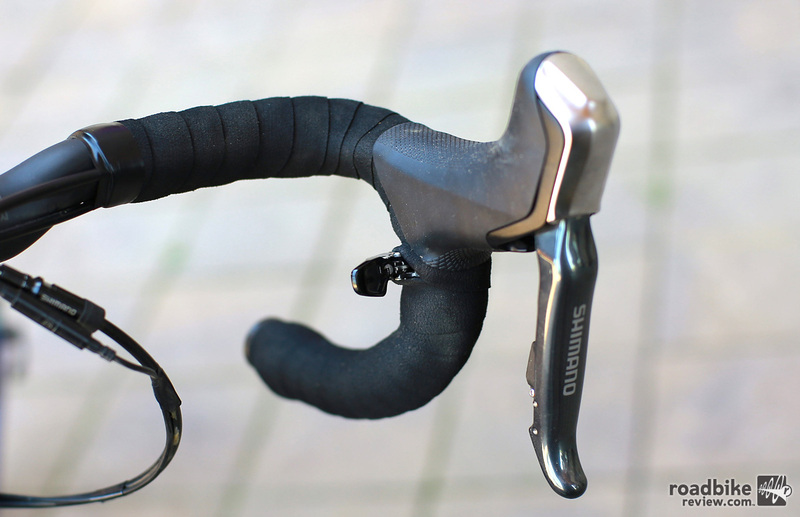 Making the switch to “Diverge plus” bumps that BB drop number up roughly 7mm, heightening the chance of pedal strikes. 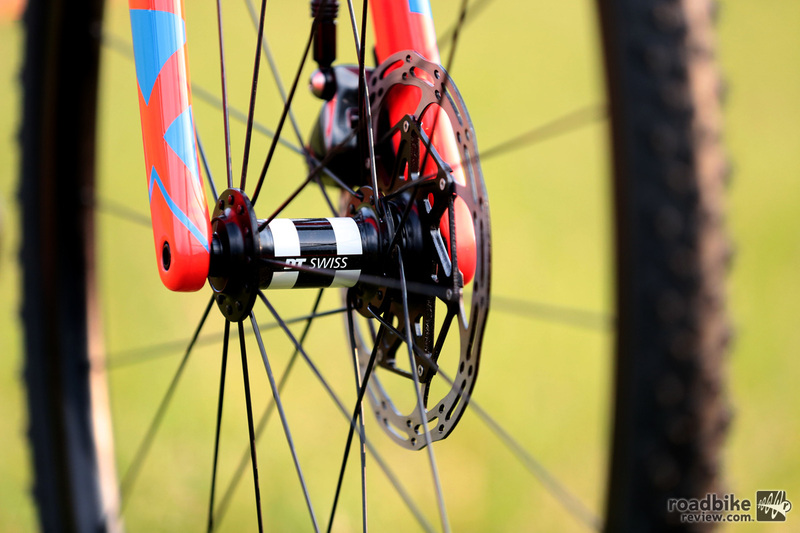 Here’s the full geo rundown. 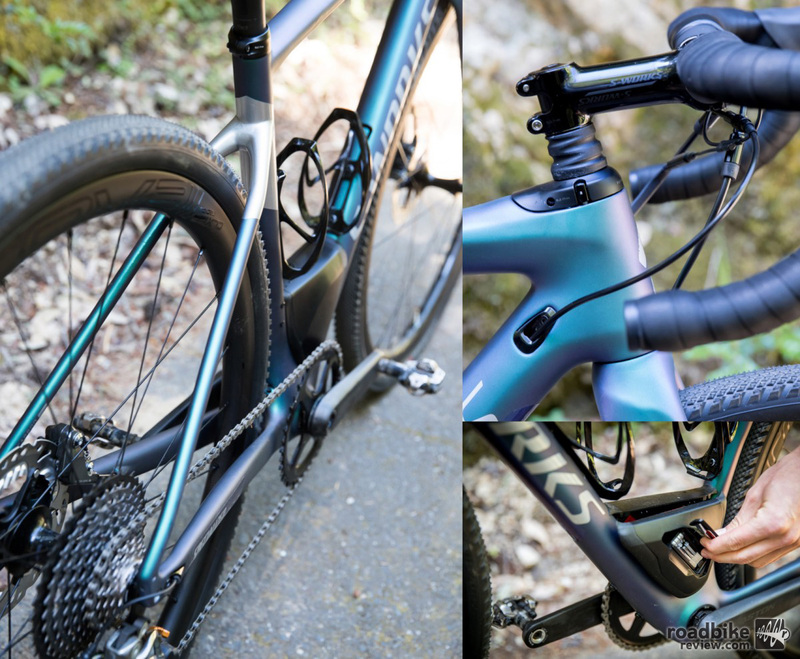 We rode the bike in both forms, and actually preferred the plus set-up for its enhanced traction on rough and loose terrain. 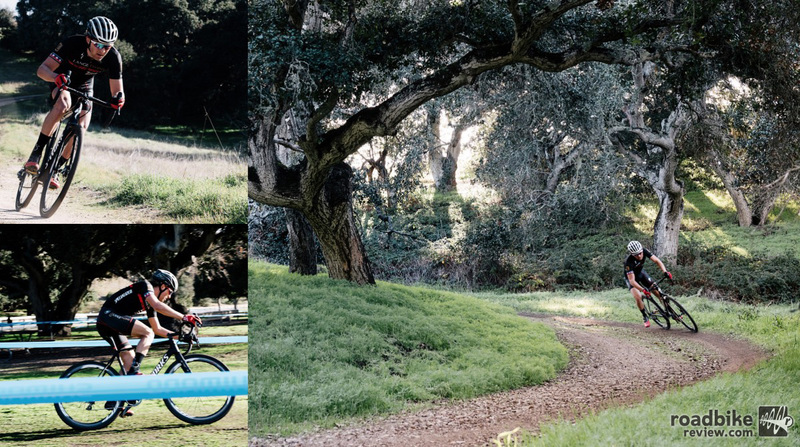 Just be very mindful of trying to pedal through turns, lest you strike a pedal. 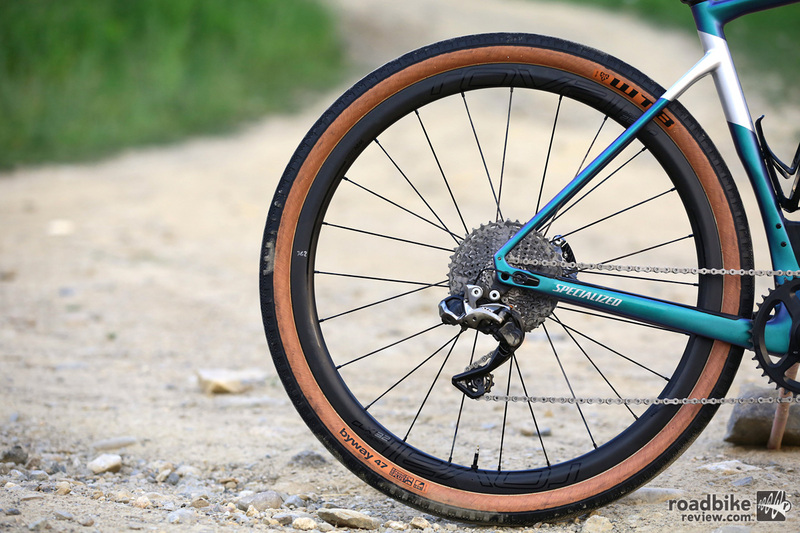 In part for this reason, the new Diverge’s tire sweet spot is pegged at 700x38mm and upper tier builds are spec’d with Specialized Trigger Pro 60tpi tubeless ready tires in that size. 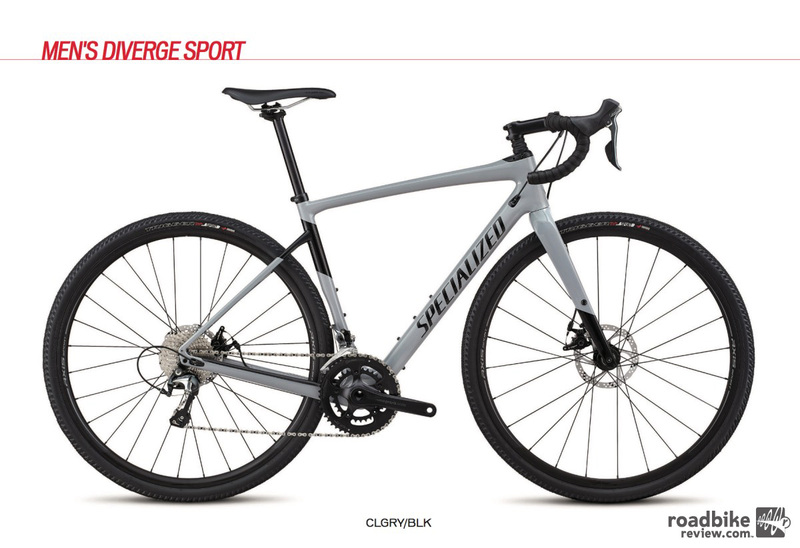 The 2018 Diverge also gets a new carbon lay-up, which Specialized says resulted in an 880-gram S-Works level frame (size 56cm). 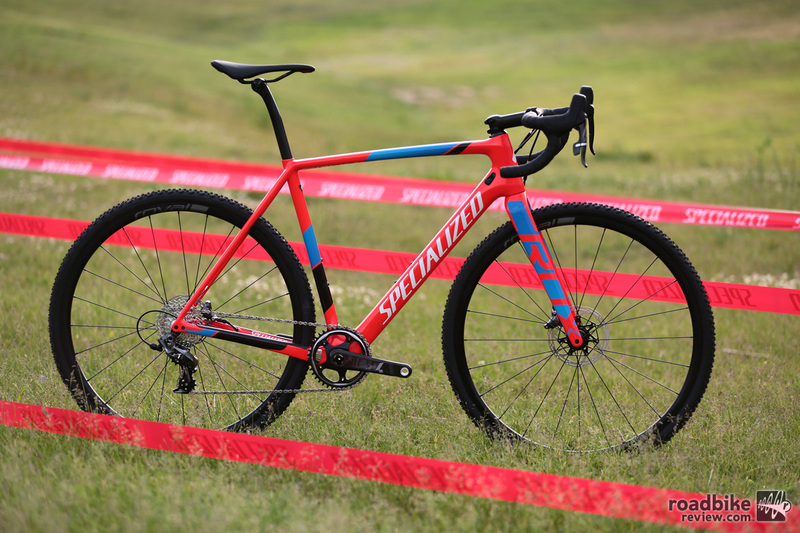 That means a complete S-Works build, which includes a 35mm travel Command Post XCP dropper post and the 20mm Future Shock, comes in at 18.5 pounds. Not bad for a bike that you can ride on almost any type of terrain. 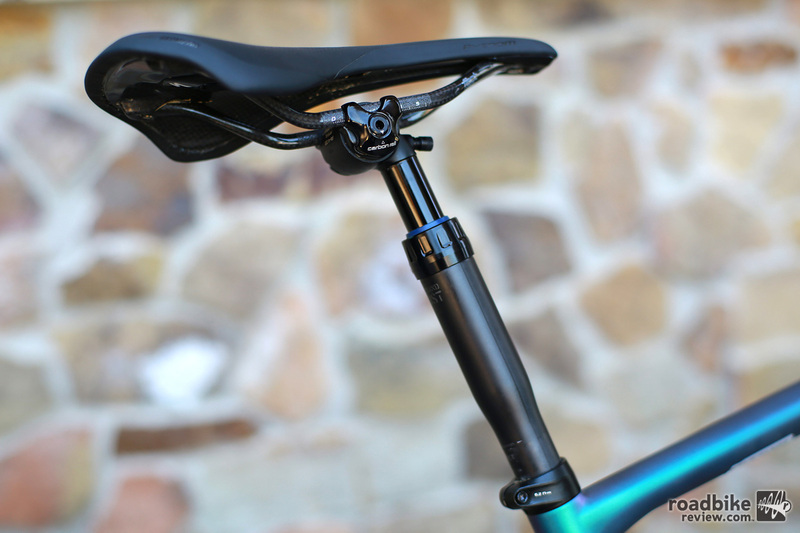 The other primary tweak besides BB drop was extending the frame’s wheel base, which is another nod toward control and stability. 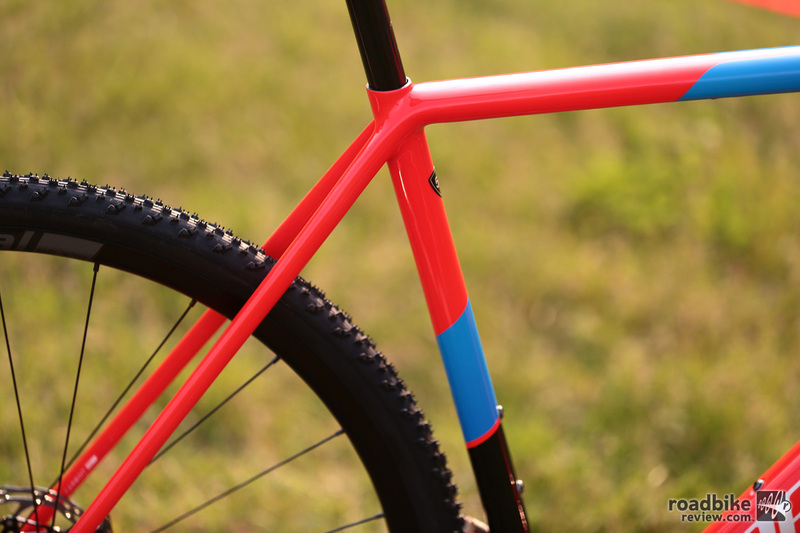 The new Diverge frame comes in sizes 48cm to 61cm with wheelbase measures of 997mm to 1036mm. 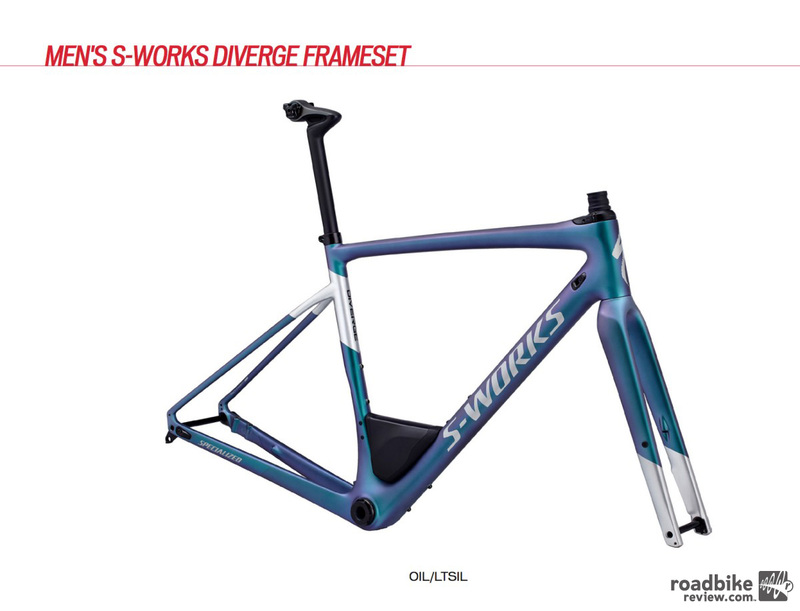 For comparison sake, figure a traditional road bike with a similar frame size run would be in the 960mm-1110mm range. 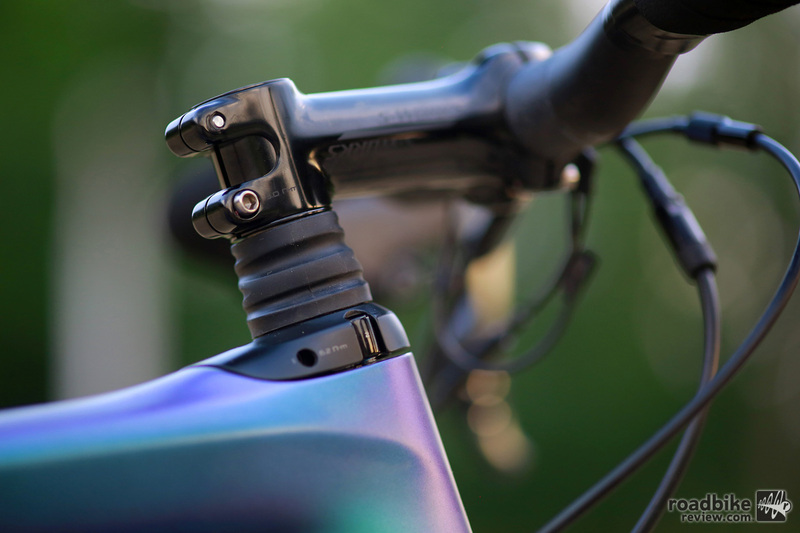 The Future Shock provides 20mm of progressive suspension. 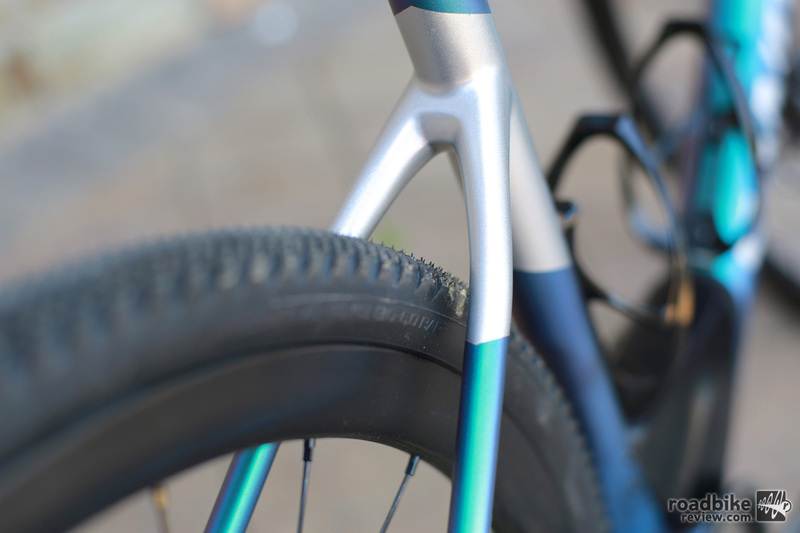 Additional notable features of the new Diverge include thru-axles front and rear, a beefy carbon fork on most builds, fender mounts, three bottle mounts, flat mount disc brake standard, and compatibility for a SWAT Box at the junction of the downtube and seat tube. 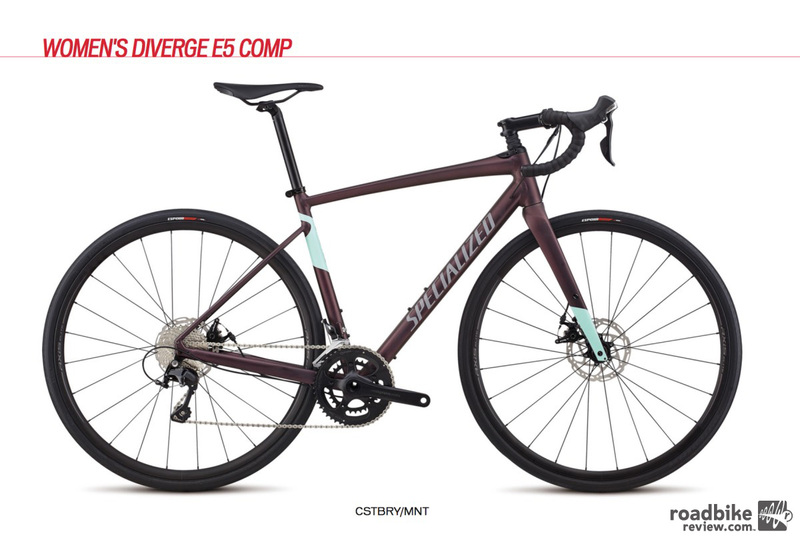 All told, the Diverge will be offered in eight men’s builds and five for women. 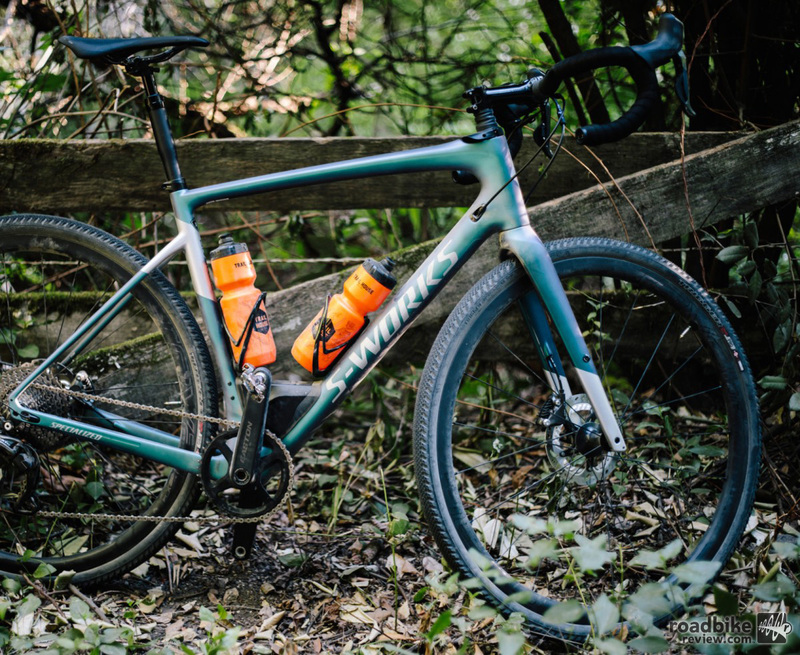 We spent the better part of two days testing the high-end men’s S-Works Diverge ($9000) and still have a smile on our face. Spec includes the aforementioned dropper post, a Shimano XTR Di2 1×11 drivetrain, and Roval CLX 32 Disc carbon wheels. 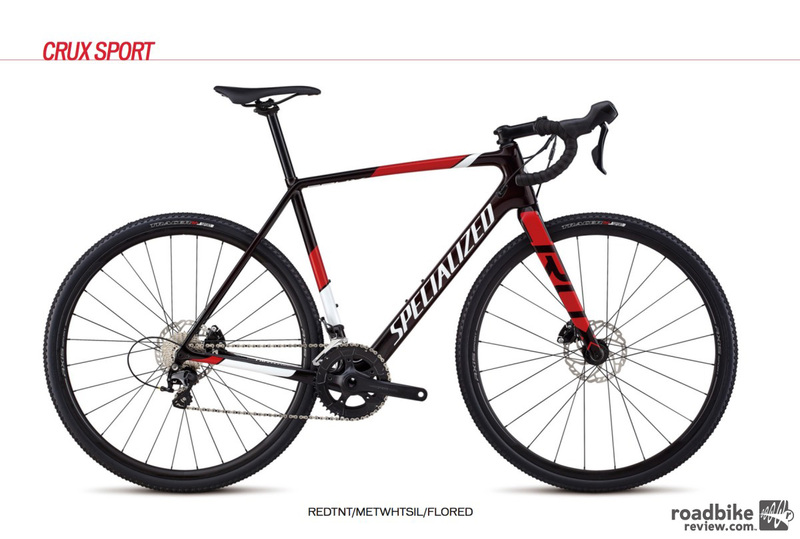 We’ll get into more details after some more testing time, but this is seriously fun bike that’s legitimately at home on pavement or dirt. No, it doesn’t pedal like a Tarmac or devour singletrack like a Stumpjumper. 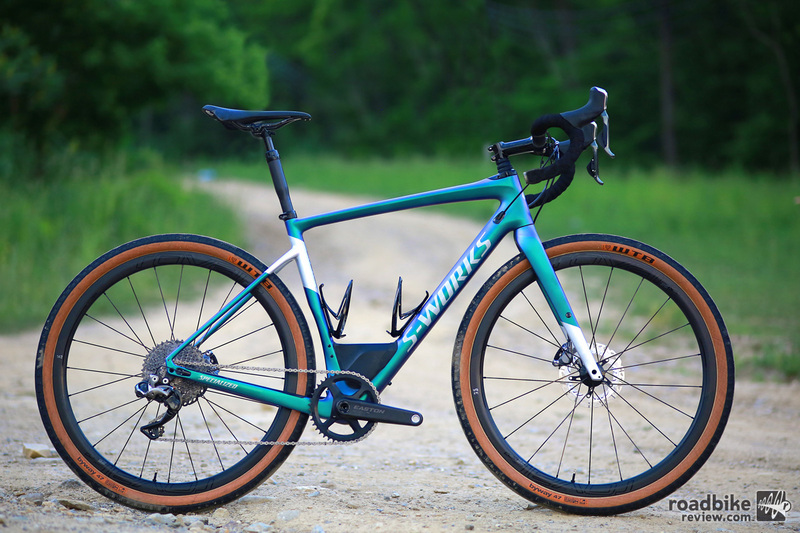 But if you’re looking to connect your favorite paved and dirt roads, and toss in some occasional trail time, bikes such as the Diverge are worth a long look. 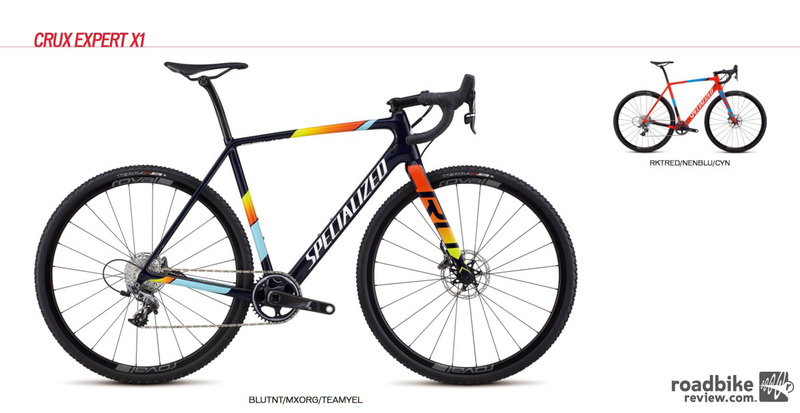 Also getting a significant makeover is Specialized’s pure bred cyclocross racer. 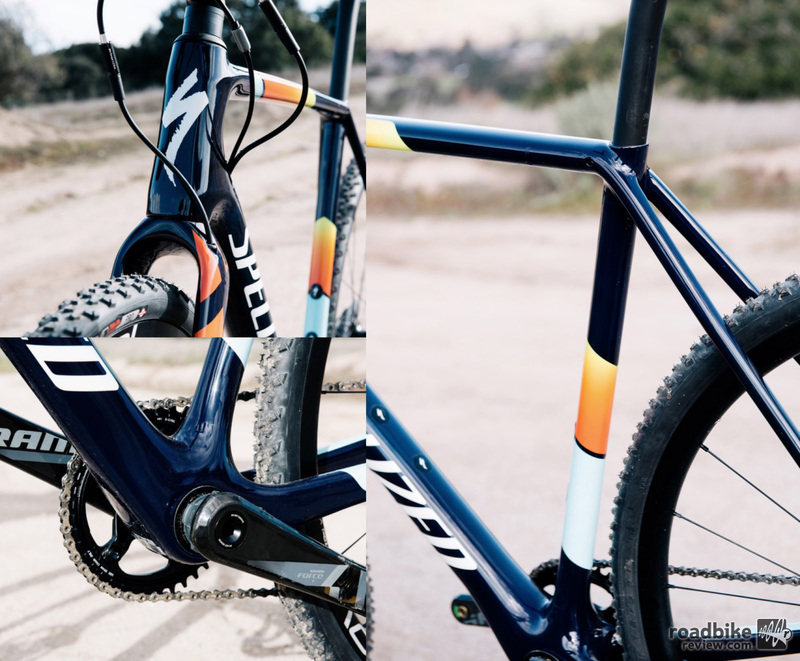 The 2018 Crux frame is a claimed 400 grams lighter than its predecessor (900 grams, size 56cm), has shorter chainstays at 425mm, and thru-axles front and rear. 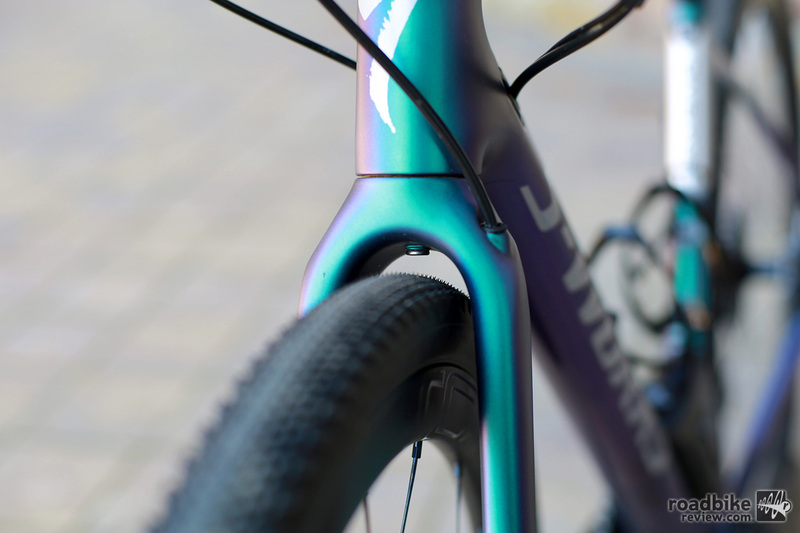 There are seven frame sizes from 46cm-61cm, and all apply the company’s rider first engineering concept, where carbon lay-up schedules are specific to frame size assuring the bikes share the same desired ride characteristics. 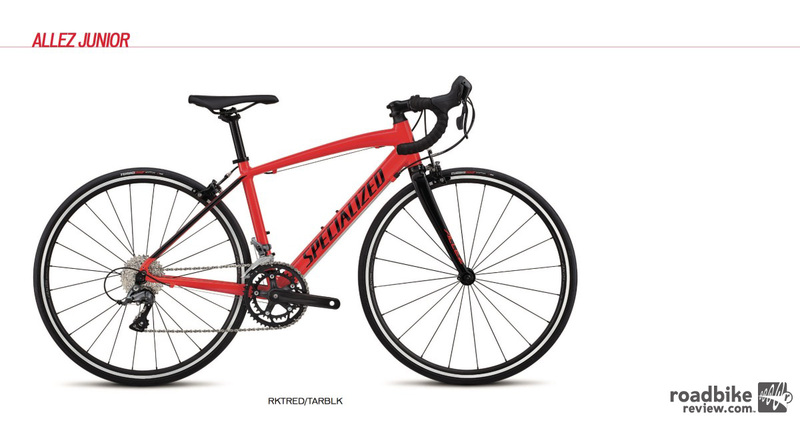 Specialized also says it has increased rear end compliance by dropping the seat collar. 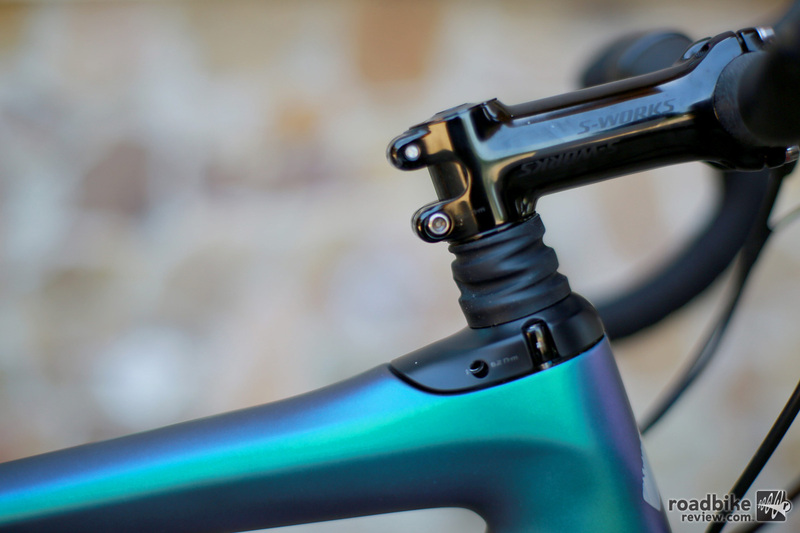 The new Crux features a 20mm lower collar for more seatpost deflection. 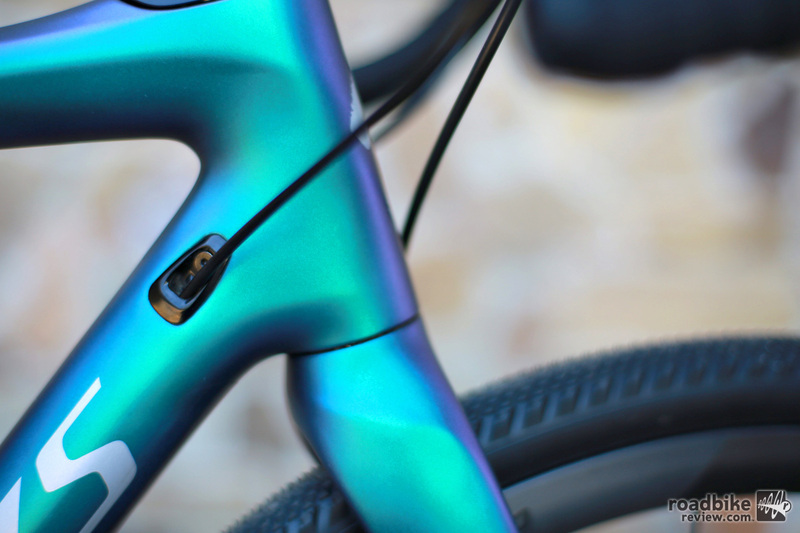 It also adopts the same rear hub spacing as the disc versions of the Roubaix, Diverge, Venge, and Tarmac with 12x142mm rear axle spacing and 160mm rotors. 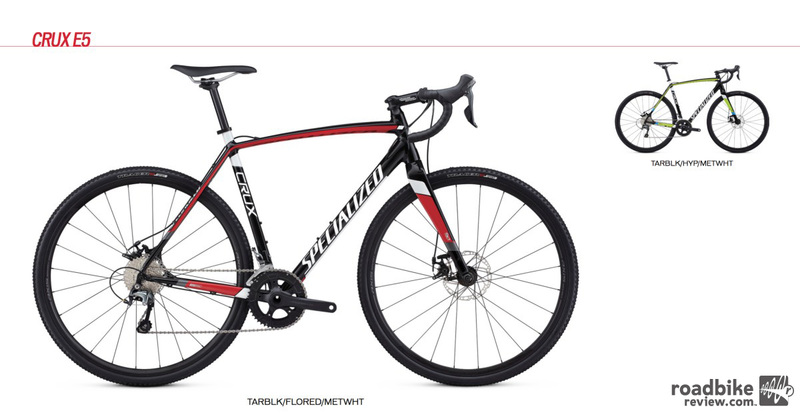 That, of course, makes swapping wheels between bikes much easier. 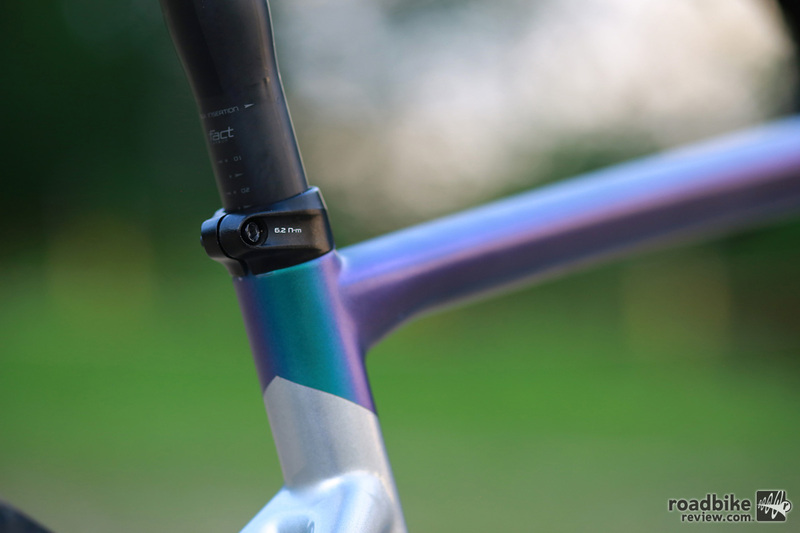 Here’s the full geo rundown for the new Crux. 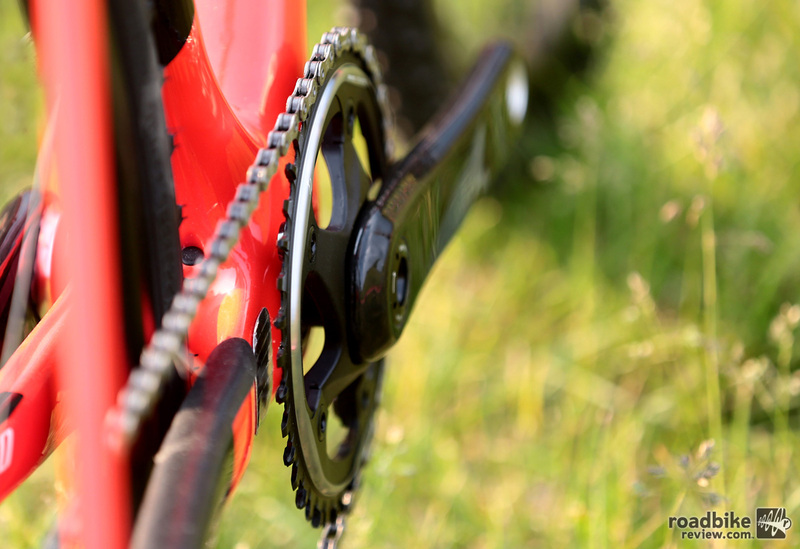 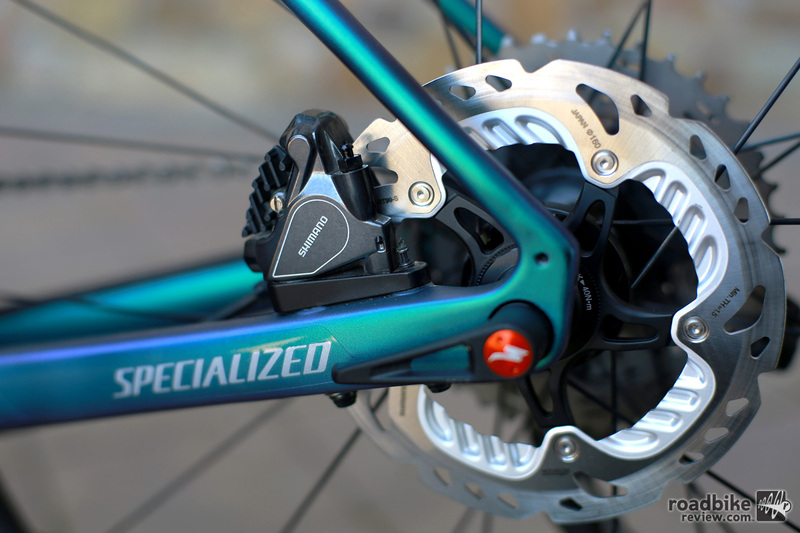 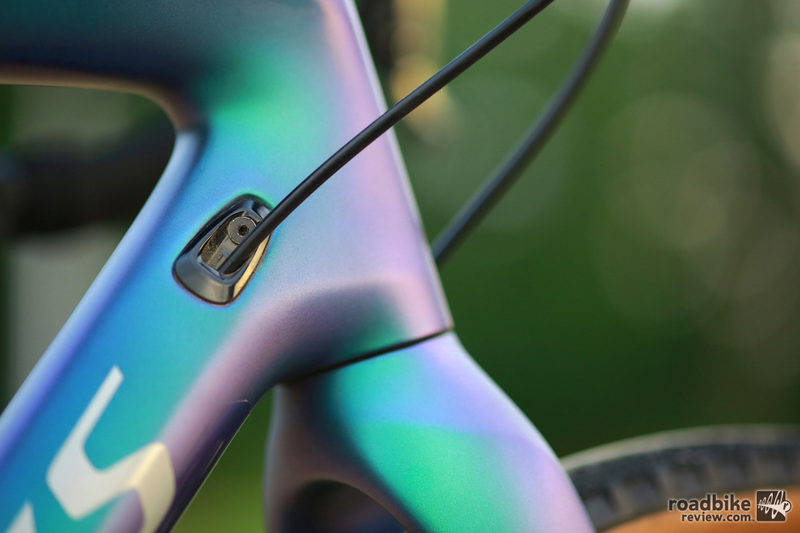 Drivetrains options are 1x or 2x using a clamp-on front derailleur, and select S-Works models feature a special hydrophobic, mud-shedding paint. 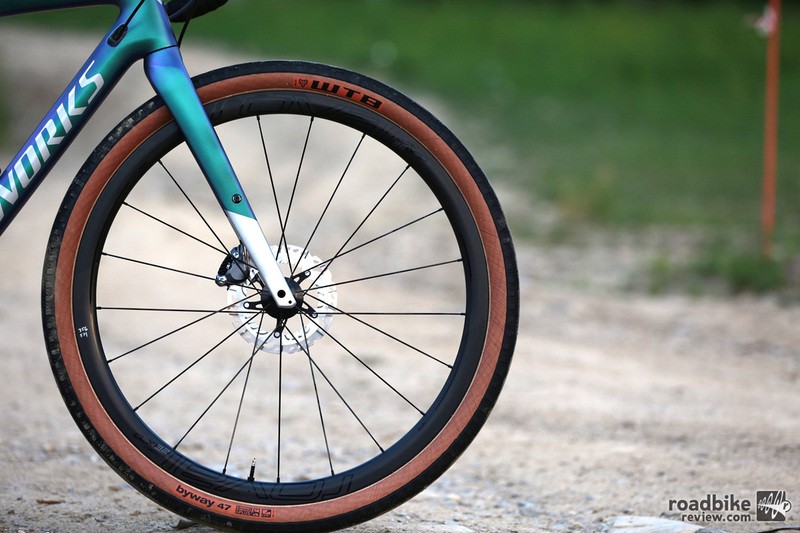 Tire clearance with the stock 33mm tires is 8mm, which is aimed at improving mud clearance (or letting you run wider tires). 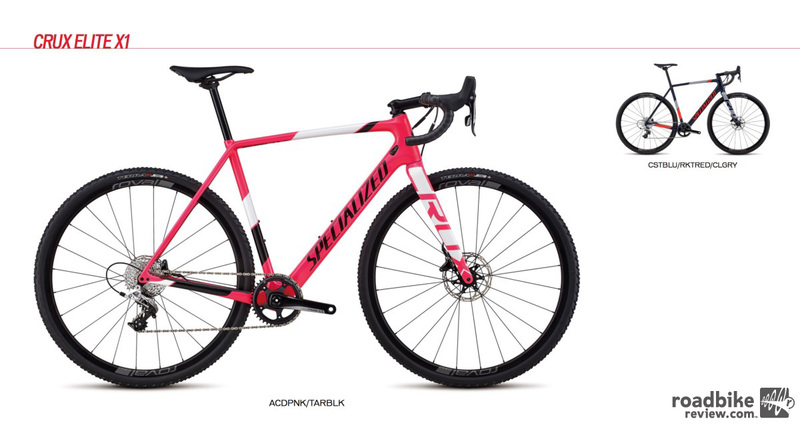 In companion Specialized is also bringing a pair of new CX tires to market in the Tracer (dry/intermediate) and Terra (mud). 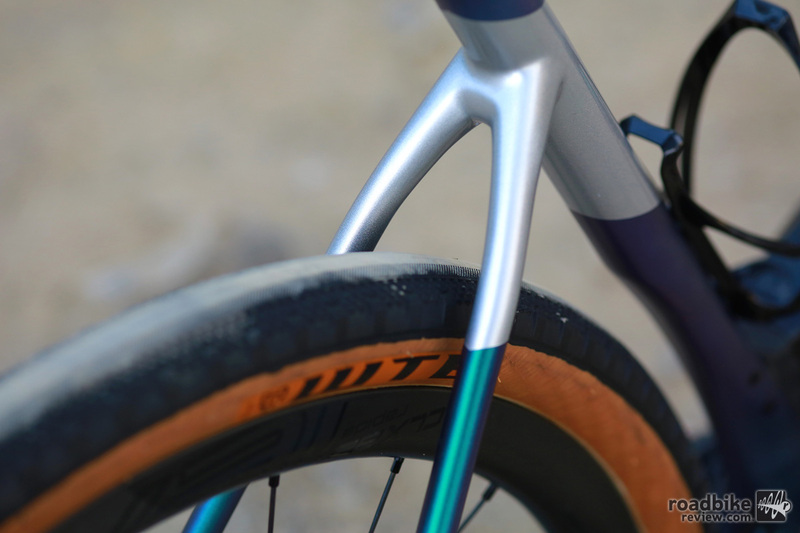 They both come in tubeless ready clincher and tubular. 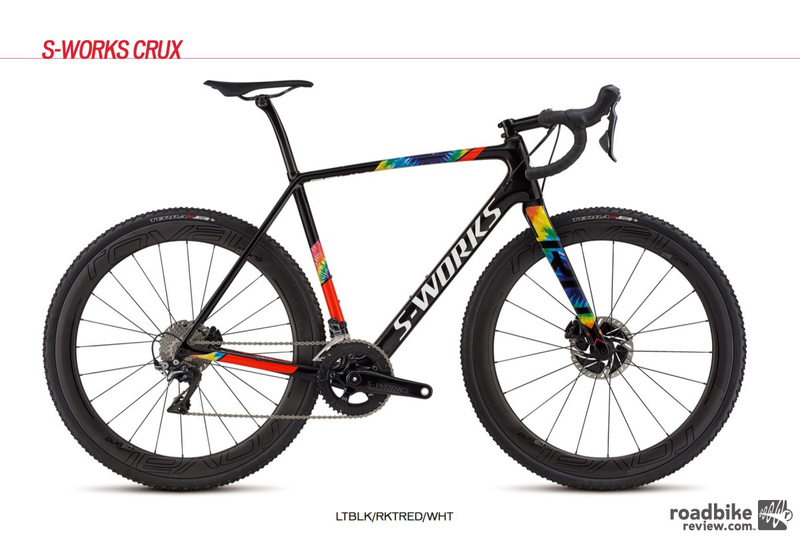 The new Crux comes in six builds, highlighted by the S-Works model ($7500) with Shimano Dura-Ace Di2 drivetrain and Roval CLX 50 Disc carbon wheels. 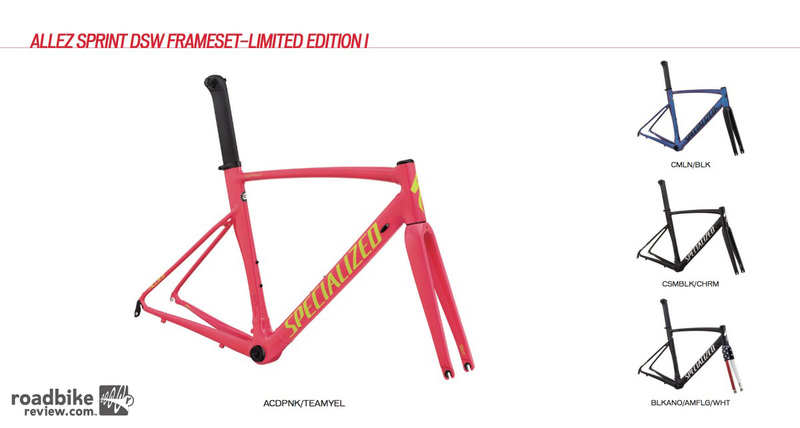 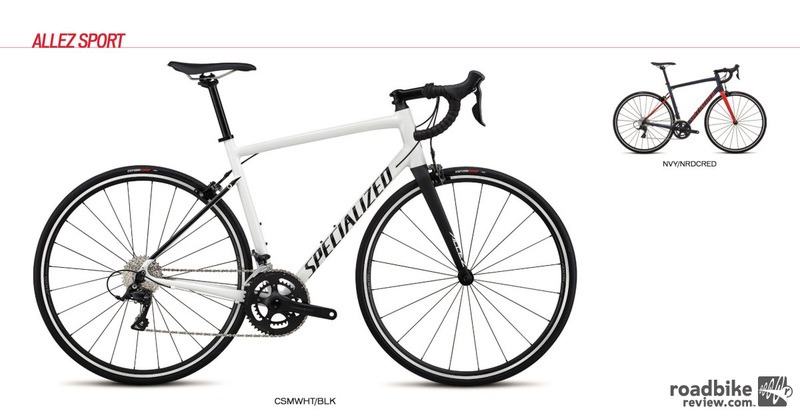 By lowering the seatstays, Specialized claims its revised Allez is now more comfortable and more aero. Last (at least in terms of cost) is the Specialized Allez alloy road line, which the company boasts now includes the best entry level value in the bike industry. We’ll need to do some side-by-side testing before commenting further on that, but initial appearances certainly paint an attractive picture. 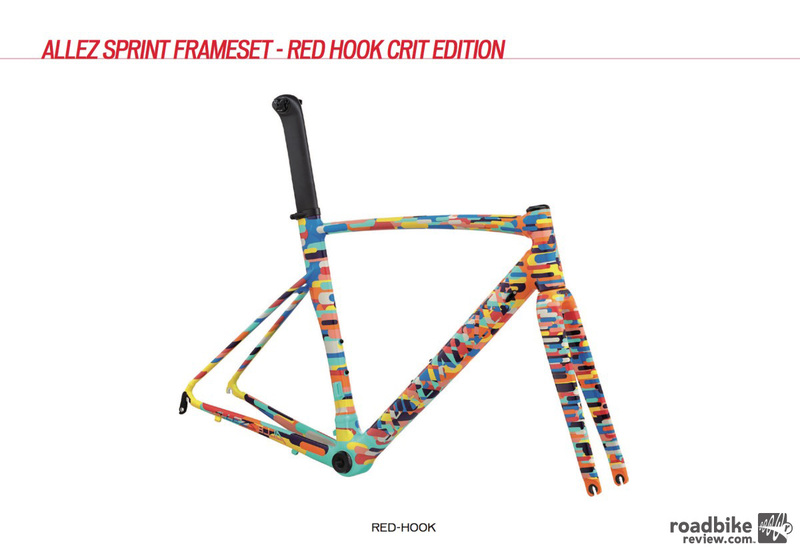 The base and junior models are $750. 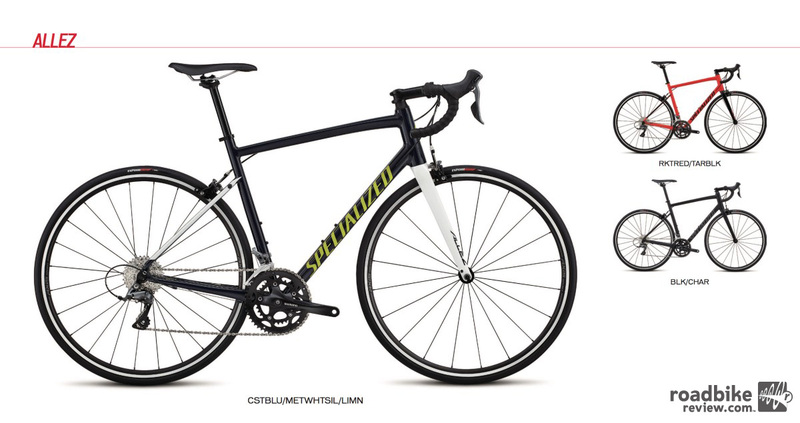 It also comes in Sport ($950), Elite ($1200), and Sprint Comp ($1800). Overall geo of the new Allez is more relaxed, but the inclusion of dropped stays and a carbon fork assure this isn’t just a cafe cruiser. 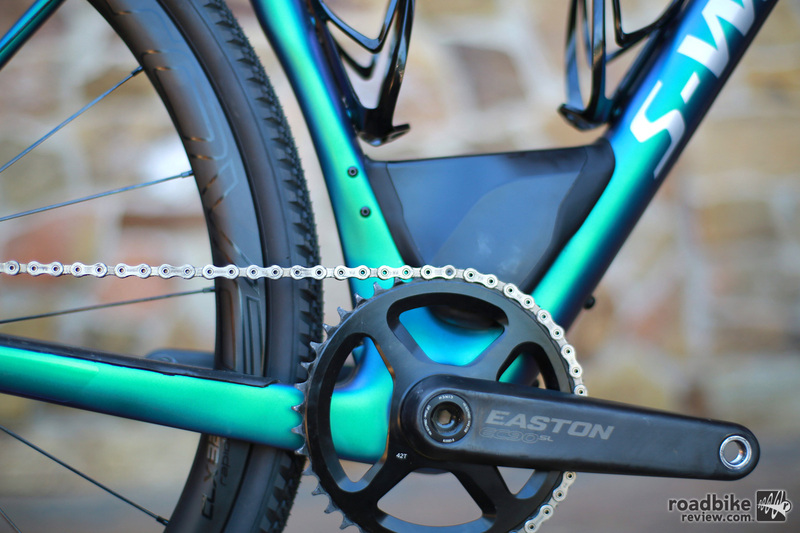 Bikes in this four-model range utilize a redesigned E5 alloy frame that Specialized says has aggressive butting profiles that save weight and improve ride quality. 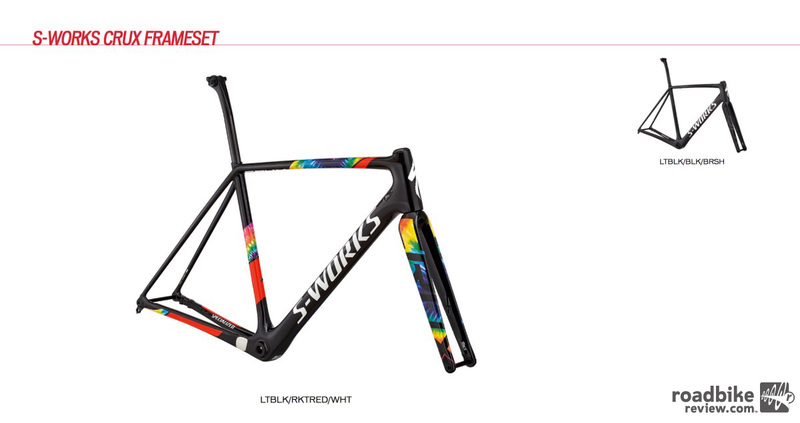 That netted a claimed 450-gram weight reduction. 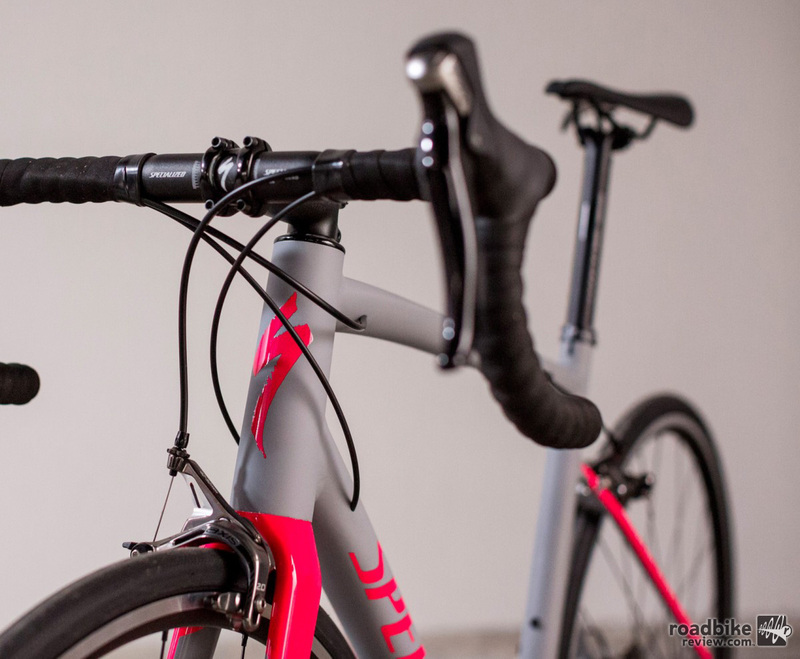 The Allez’s new frame features a tapered head tube and dropped seatstays, a change that came front wind tunnel tests. 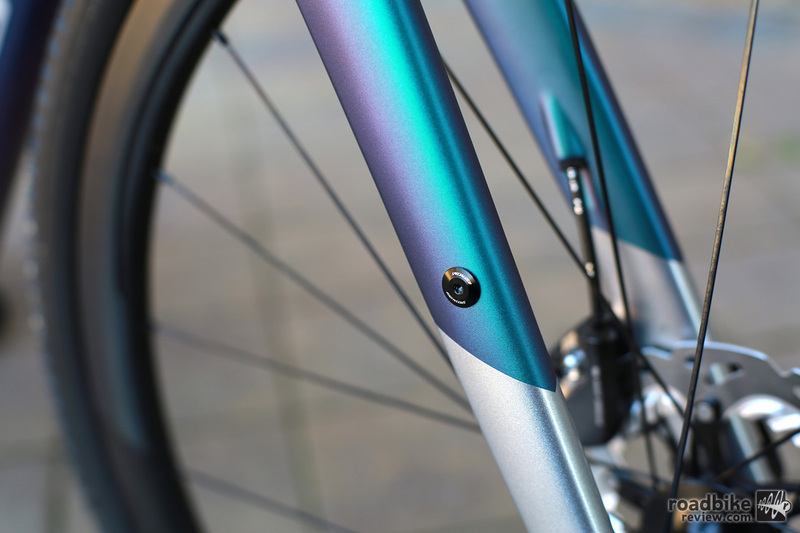 Here’s the full geo rundown. 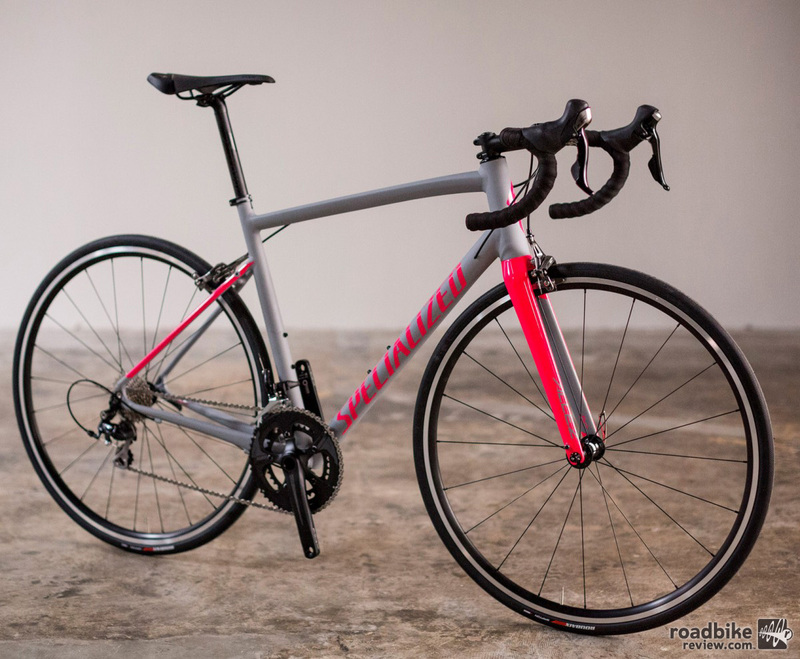 The updated Allez also has full internal cable routing, full carbon fiber fork and carbon steerer tube, rack and fender mounts, and a slightly taller head tube paired with a longer wheelbase to provide a more comfortable and stable feel. 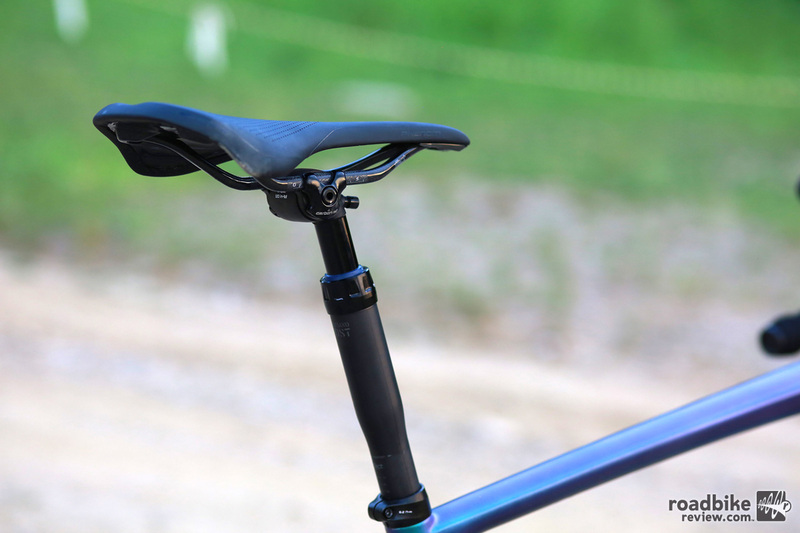 The new Crux has a lower seat collar, which is designed to provide more seatpost deflection and thus more vertical compliance. 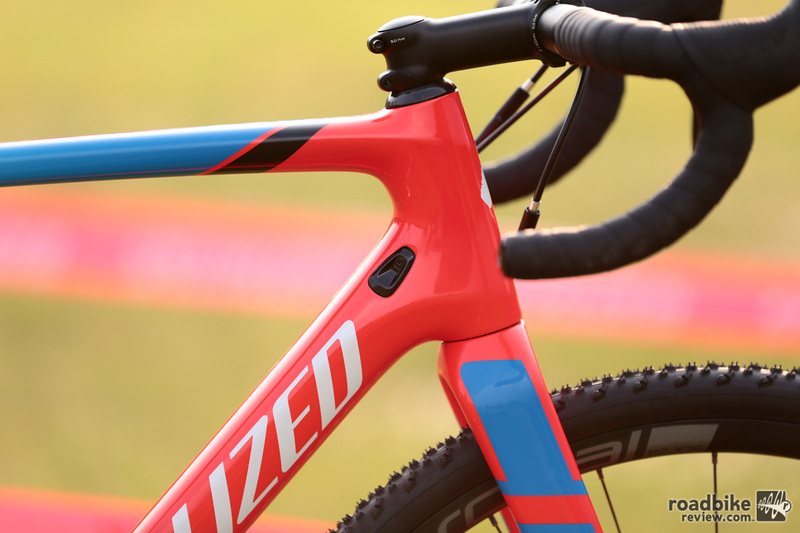 The new Crux is intended solely for cyclocross racing. 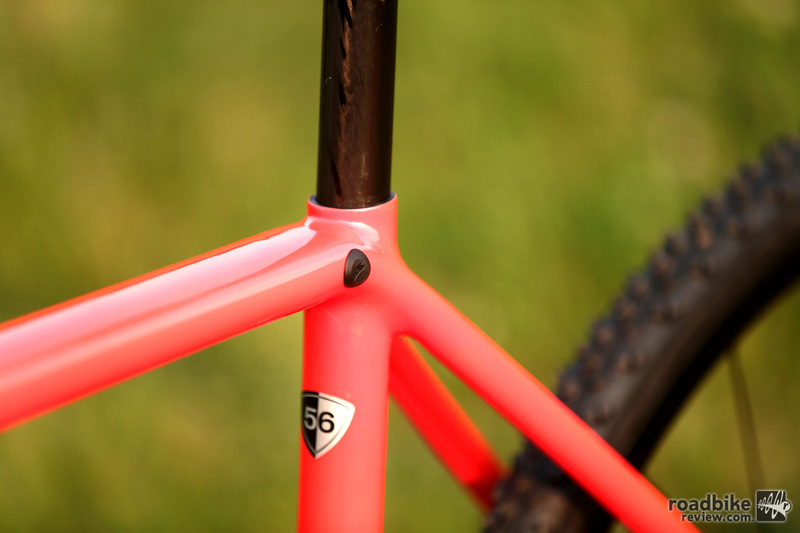 No rack and fender mounts here. 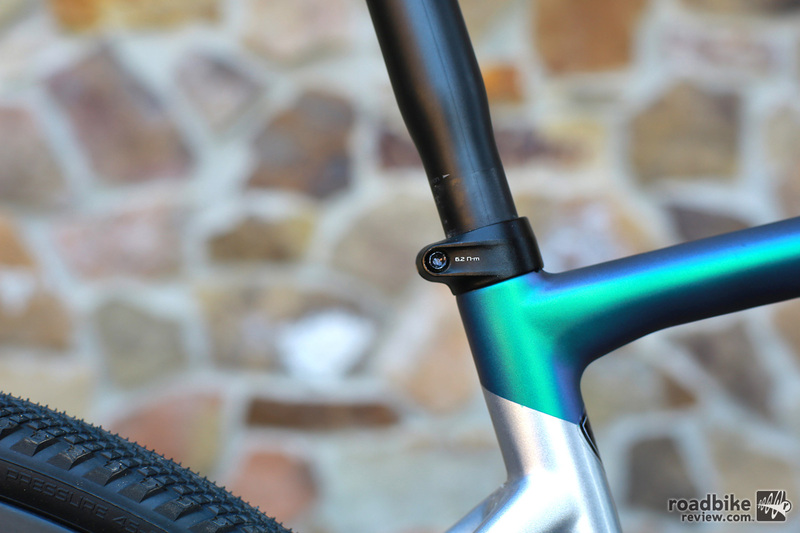 Yep, that’s a 35mm travel dropper post on a road bike — and it’s cool. 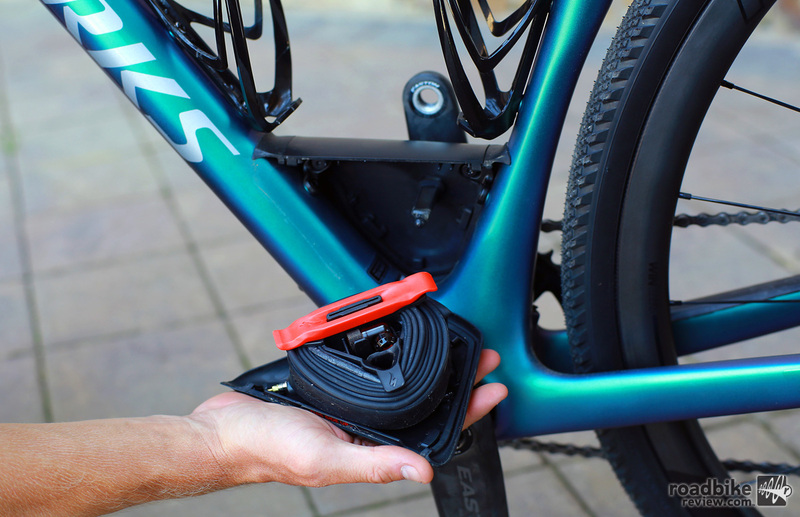 Inside that SWAT box is everything you need to change a flat tire. 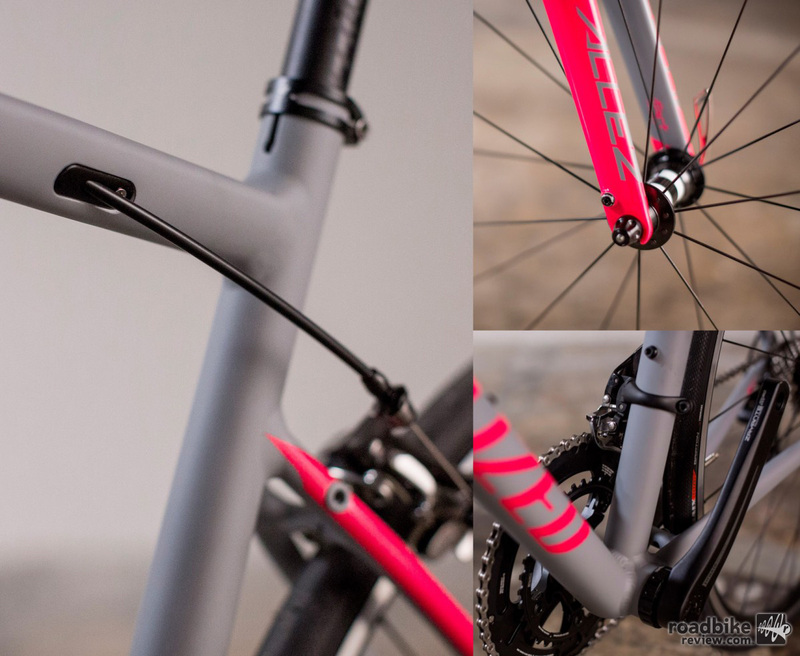 With 20mm of front suspension and a 35mm travel dropper post, the Diverge blurs the lines between mountain and road.